Jaime and I got back from an awesome awesome fourth of July weekend down in the OC. There was football on the beach and family pool time and cherry brown butter bars and fresh peaches and fireworks with the cousins and lots of huge beef ribs. All in all, an awesome time. Upon returning to our fridge after a full day of work, I found the tofu had gone "off." It was pink and green and blue and smelled a lot like the fermented bean curd that my Cambodian friends used to make various dipping sauces... but not enough like that smell to convince me that it was edible. So that went in the garbage. But thankfully, the bravas sauce I prepared on Thursday night before our trip didn't succumb to a similar fate, so I was able to throw some patatas in the oven to brown while Jaime whipped up some Asian-style pink salmon cabbage cakes. Not the same as the popiah and Hainanese chicken rice feast we had this weekend, but really not too bad. Patatas Bravas, or "brave potatoes," are a traditional Spanish tapa -- golden fried garlicky potatoes either topped with, or dipped into, a spicy, garlicky aoili. Tapas are Spain's snacks or appetizers, often taken with a drink in the afternoon, or late in the evening. This version, which I made with new potatoes, is roasted in olive oil instead of fried, but the Bravas sauce is the same tangy, hot delicious mix you can find in many bars and restaurants in Madrid. Heat your oven to 400 degrees. Chop potatoes into 1/2'' cubes. Toss in a bowl with olive oil, garlic, paprika and salt until evenly coated, then transfer to a baking sheet. Cook for about 1 hour or until brown and crispy, but not burnt. Take the pan out of the oven and stir every 20 minutes or so to prevent sticking and make sure potatoes brown evenly. In the meantime, prepare the bravas sauce. In a blender, mix together all the sauce ingredients until well-incorporated. Serve potatoes hot, with sauce on the side for dipping or with 2-3 tbsp mixed in. Glad to see your 4th went well. Mine was awesome, too--got to play drums with the band this year instead of guitar, and we were really cookin'! Anyway, not that I don't like the recipe posts (this one looks especially awesome, think we might have to try this), but this blog is at its best when you're talking about the farm. All that is so interesting to me. 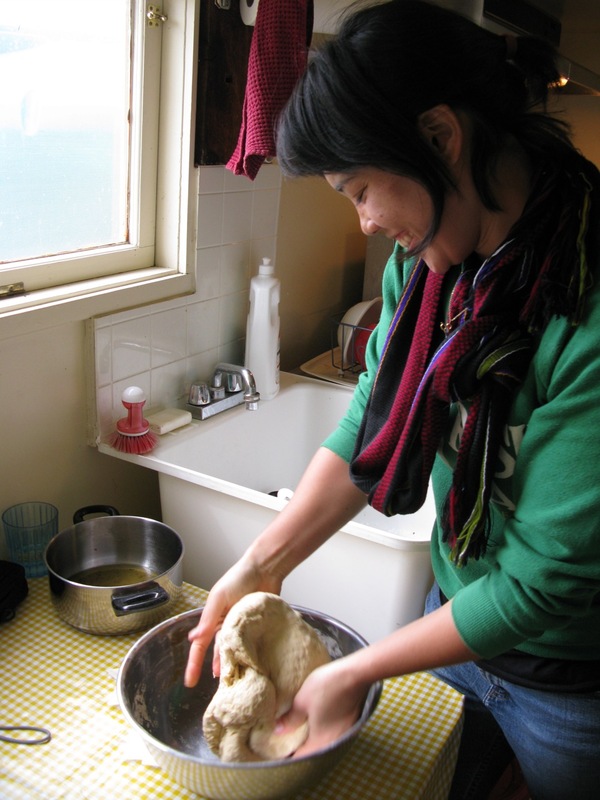 Hi Jess, I discovered your wonderful blog from Jaden's Steamy Kitchen, love your blog! 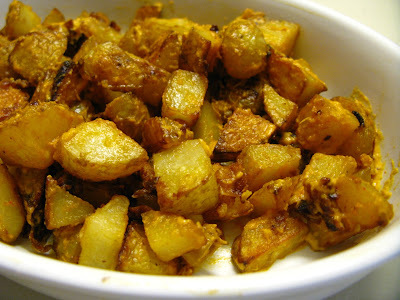 Spiced potatoes are one of my all-time favorite side dishes- I can't think of anything that's more comforting than this! I will be back here often! I'm so glad you stumbled onto my blog! Spicy potatoes are super tasty. Me with my harebrained schemes: after I came up with the sauce, all I could think about for the rest of that week was how I could bottle it up and sell it like the sriracha man!